Tottenham missed the opportunity to go top of the Premier League as they lost to an outstanding West Ham United performance at Upton Park. Michail Antonio's seventh-minute header from Dimitri Payet's corner gave Slaven Bilic's side a narrow victory margin - but the Hammers were vastly superior to a disappointing Spurs, who never threatened the victory they required to overhaul Leicester at the top of the table. Spurs were second best in all departments and when they did threaten, West Ham keeper Adrian saved from Toby Alderweireld's shot and Harry Kane's rebound, the England striker also failing with a good chance at the far post late on. And how West Ham's fans lapped it up as they relished putting the skids under Spurs while only leaving themselves one point off the top four in this most unpredictable of seasons. Spurs have not been at the summit of the top tier in March since 1964 - and they will have to wait a little longer after one of their poorest performances of the season. Mauricio Pochettino's team pride themselves on pressing their opponents but had the tables turned on them ruthlessly by their hosts, especially in a harrowing first 45 minutes in which they were run off their feet and out of position. Spurs could never gather any momentum or rhythm and, on the rare occasions they threatened, the normally reliable Kane was unable to find the target. This was only their fourth defeat of the Premier League season - and they have an immediate chance to make amends in the north London derby with Arsenal at White Hart Lane on Saturday. There is no reason to lose faith in a Spurs side that has come so far this season - but they still need to answer the question about whether they can crack it when the heat is on, because they came up short at West Ham. Bilic stepped into the breach when a call from Real Madrid snatched Rafael Benitez away from West Ham only hours before he was scheduled to succeed Sam Allardyce at the Boleyn Ground. The Croat had a short but distinguished playing career at West Ham - and has brought charisma and style to a club that prides itself (not necessarily with much justification in the recent era) on playing with a certain style and panache. There is no mistaking the style now, built on the no-frills framework of James Collins in defence and the admirable consistency of captain Mark Noble in midfield - and with glorious attacking flourishes. Payet is the darling of the Hammers' fans, the French midfield man signed for £10m from Marseille in the summer, bringing a buzz of excitement every time he gets the ball. Throw in the skill of Manuel Lanzini, the unpredictability of Antonio and the power of on-loan Emmanuel Emenike, and Bilic is putting together a potent combination - as Spurs found to their cost. Just turn right out of Upton Park station and on to Queen Street and you get the instant flavour of what makes the Boleyn Ground so special. Vibrant, busy and with all the sights, sounds and smells of one of the great traditional old English football arenas - an arena that will sadly soon close its doors forever. There are only five more Premier League games here (and the possibility of an FA Cup replay against Manchester United should West Ham draw at Old Trafford) before they make the short journey to the Olympic Stadium for next season. And how this venue will be missed. Time moves on and West Ham have been presented with a perfect opportunity to progress, but night games in particular are very special here in east London. The home fans give the ground a thunderous atmosphere from before kick-off, when the bubbles machine accompanies the club's old anthem 'I'm Forever Blowing Bubbles' and continues non-stop in a relentless, intense environment. The Hammers will lose something when they leave here, as it remains one of the great landmarks of English football. Michail Antonio was as tireless off the ball as he was dangerous on it. The winger now has four goals in his last seven appearances. West Ham United manager Slaven Bilic: "To match Spurs you have to play well, but to outplay them and win was magnificent. "Maybe I'm biased but they should be more happy with the result than us, because it could have been more. "In all aspects of football we were magnificent and I congratulate the players." Tottenham Hotspur manager Mauricio Pochettino: "We didn't start well. The first half was poor, we never found solutions to play like we normally play. "We had more freedom in the second half but if you don't score it's difficult to get the points. "We were poor. We know. We are very disappointed. But the way the players fought in the second half was fantastic." Michail Antonio has scored in six of his past eight appearances at home for West Ham in all competitions. Tottenham failed to hit a single shot in the first half of a Premier League match for only the second time in the past 13 years. This was Spurs' first defeat in 13 Premier League away games and their first since the opening weekend of the season. West Ham are unbeaten in 12 successive home league games - their best run since April 1998. Tottenham will be itching to get back to winning ways but face a tough north London derby at home to Arsenal on Saturday (12:45 GMT). On the same day Slaven Bilic takes his West Ham side to Everton (15:00 GMT) - a place he knows well, having turned out for the Toffees in his playing career. 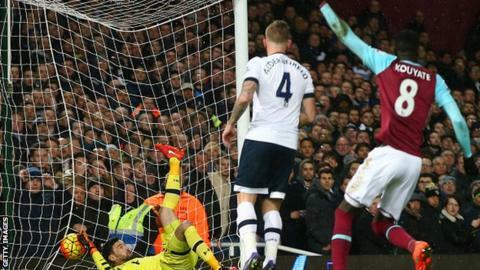 Match ends, West Ham United 1, Tottenham Hotspur 0. Second Half ends, West Ham United 1, Tottenham Hotspur 0. Diafra Sakho (West Ham United) wins a free kick on the right wing. Corner, Tottenham Hotspur. Conceded by Reece Oxford. Attempt blocked. Dimitri Payet (West Ham United) right footed shot from outside the box is blocked. Assisted by Diafra Sakho with a headed pass. Corner, West Ham United. Conceded by Kieran Trippier. Corner, Tottenham Hotspur. Conceded by Aaron Cresswell. Substitution, West Ham United. Diafra Sakho replaces Manuel Lanzini. Attempt blocked. Aaron Cresswell (West Ham United) left footed shot from outside the box is blocked. Assisted by Dimitri Payet. Substitution, Tottenham Hotspur. Tom Carroll replaces Kevin Wimmer. Substitution, West Ham United. Andy Carroll replaces Emmanuel Emenike. Attempt missed. Aaron Cresswell (West Ham United) left footed shot from outside the box is too high. Attempt missed. Son Heung-Min (Tottenham Hotspur) left footed shot from outside the box is high and wide to the left. Assisted by Eric Dier. Attempt missed. Harry Kane (Tottenham Hotspur) left footed shot from the left side of the six yard box misses to the left. Assisted by Christian Eriksen with a cross. Attempt missed. Michail Antonio (West Ham United) right footed shot from the centre of the box is too high. Assisted by Dimitri Payet with a cross following a set piece situation. Substitution, West Ham United. Reece Oxford replaces James Collins because of an injury. Kevin Wimmer (Tottenham Hotspur) wins a free kick in the defensive half. Foul by Emmanuel Emenike (West Ham United). Attempt saved. Christian Eriksen (Tottenham Hotspur) right footed shot from the right side of the box is saved in the top right corner. Assisted by Erik Lamela. Attempt missed. Toby Alderweireld (Tottenham Hotspur) right footed shot from outside the box is high and wide to the right. Assisted by Eric Dier. Substitution, Tottenham Hotspur. Dele Alli replaces Nacer Chadli. Corner, Tottenham Hotspur. Conceded by Cheikhou Kouyaté. Attempt blocked. Harry Kane (Tottenham Hotspur) left footed shot from very close range is blocked.